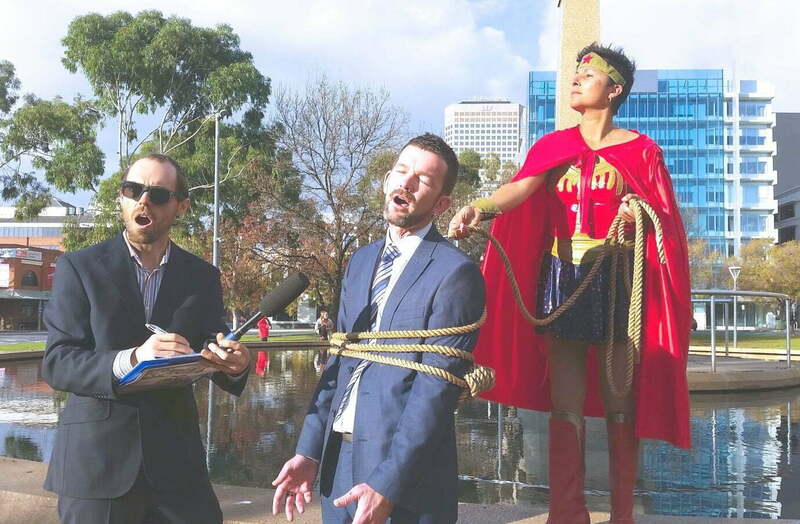 Today, RM reports the surprise and astonishing arrival of Wonder Woman at Light Square Adelaide, in apparent pursuit and capture of a nefarious businessman. 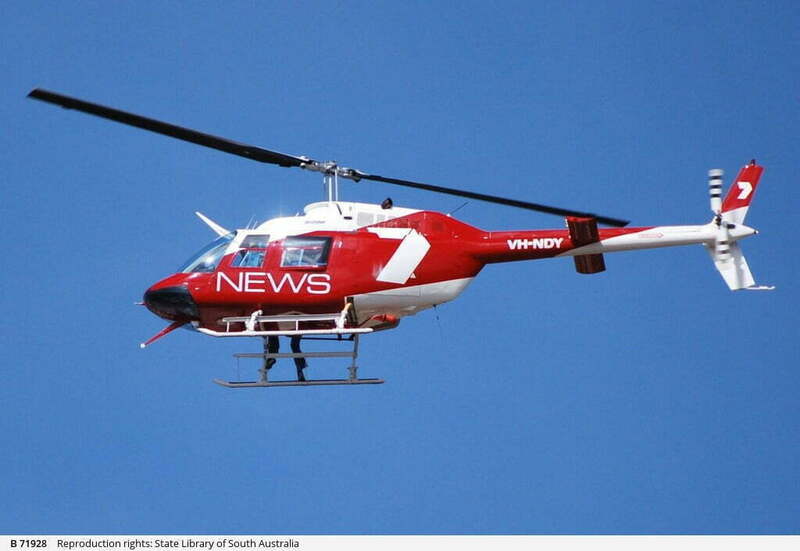 An RM photo correspondent was fortunate to capture and report as the drama unfolded ironically at Light Square Adelaide , mid Sunday afternoon EST. 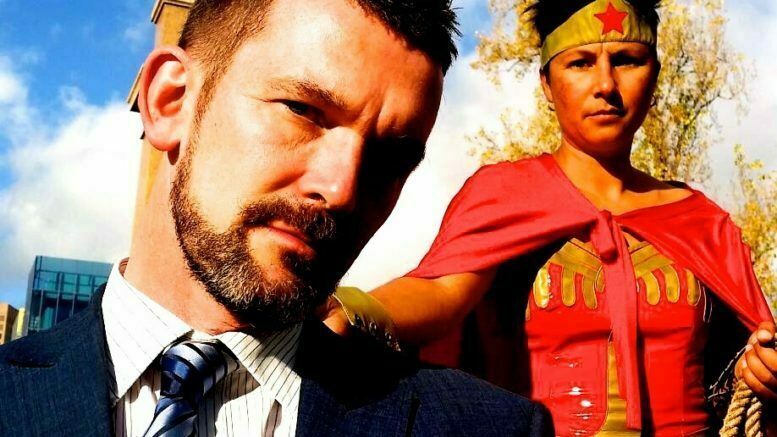 Stunned onlookers witnessed Wonder Woman in action as she finally caught up with a businessman, allegedly planning a nefarious business deal, the details of which Wonder Woman would not reveal. There has been too many scandalous deals which are not good for the state or your country, it’s time for this state to become transparent, honest and open with its dealings, enough is enough! Why here at Light Square, the monument and resting place of the famous Colonel William Light, Founder of Adelaide? The Colonel was a good man who served the public in the genuine sense of the word, he is a rare historical example of the type of person that should be the captain of industry or in public office, Light shone alongside his allies to overcome the dark forces around him..
As the crowd grew the questions flew fast and thick and Wonder Woman’s impatience started to become obvious as she coiled up her rope of truth…’will you run for office?’ asked one onlooker, ”is this the start of the Wonder Woman Party?, asked another. “That’s all I have to say”, responded Wonder Woman as a news helicopter flew overhead and streams of people arrived to the scene. I have other duties to attend to and now gift your state this golden rope of truth, may honesty and good governance finally prevail, I offer your state my blessings and trust this gift will be used wisely for all South Australians.. In regard to the ‘other duties’ Wonder Woman was referring to, RM can almost certainly reveal that in her mere mortal form during the week, Wonder Woman is otherwise known as Aasha Shaw, mother, teacher, and manager of the Glenelg Organic Corner Store. 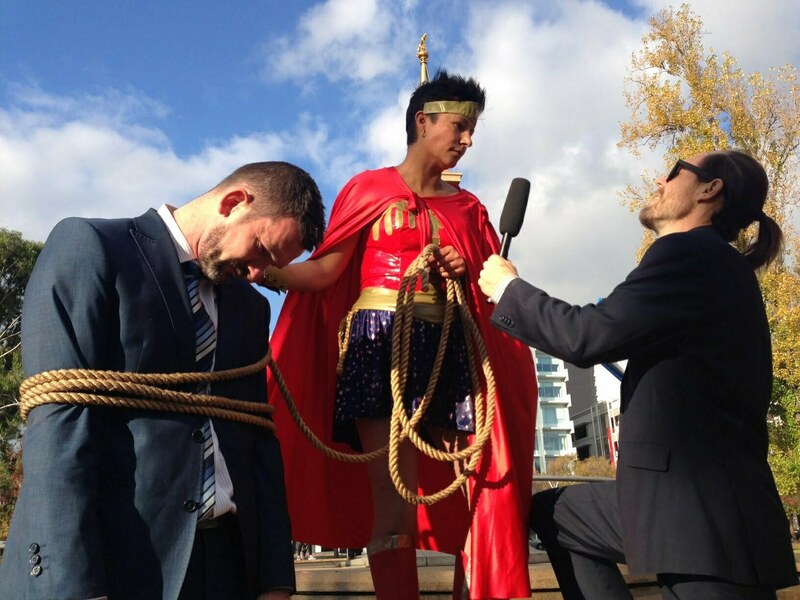 When RM contacted the market, this speculation was neither denied or confirmed, they did however, confirm that Aasha Shaw appeared to bear a remarkable resemblance to the Wonder Woman who appeared at Light Square. Speculation and rumors that Shaw and the businessman she apprehended today are closely associated also cannot be confirmed. RM will continue to update this breaking news report as more details become available.